Unlike the PACV, the ACV made major modifications to the original SR.N5. The crew compartment was armoured and dispensed with the many passenger windows. In order to make infantry operations easier the front door was enlarged and new wider weight-bearing side decks replaced the PACV's fragile decks. More powerful engines were also fitted along with an improved “fingered” skirt which was segmented into 12 sections. The new skirt, also fitted to the Navy's PACVs for their second test deployment, was found to improve performance over rough terrain and significantly reduce spray when operating over water. 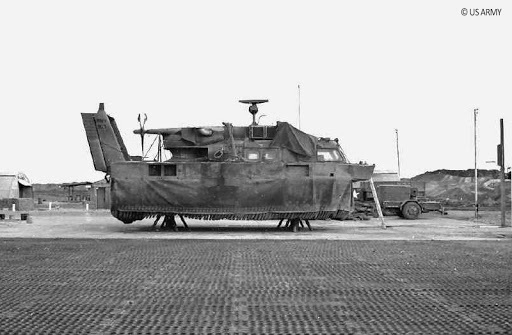 The hovercraft carried 1,000 lbs of armour and overall armour was deemed to be roughly equal to that of an M113. The engine and fuel tanks were protected against 12.7 mm rounds at 200 yards and the cabin armour was proof against 7.62 mm rounds at 100 yards. However, the crew compartment armour was found to offer little effective protection and most if not all of it was removed in the field to save weight. RPGs and recoilless rifles which would have made short work of the armour do not appear to have been encountered on operations. 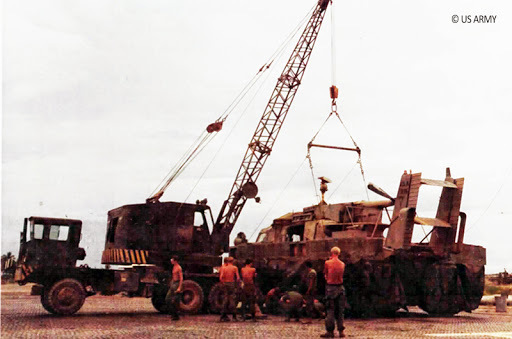 As with most AFVs in Vietnam, mines were to prove the deadliest threat with ACV 902 destroyed on 9 January 1970, either to a mine or to a dud 500 lbs bomb, and 901 suffering a similar fate on 3 August 1970, probably to a command-detonated mine. Note: several sources reverse these dates but the footage below clearly shows 901 and 903 operating together in March 1970 and Phillip Steele, 902's pilot at the time, has confirmed this online. 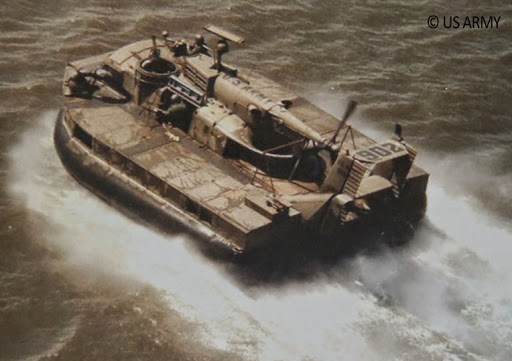 The ACVs came in two configurations: ACVs 901 and 902 were configured as Assault Air Cushion Vehicles (AACV) while 903 was equipped as a Transport Air Cushion Vehicle (TACV). 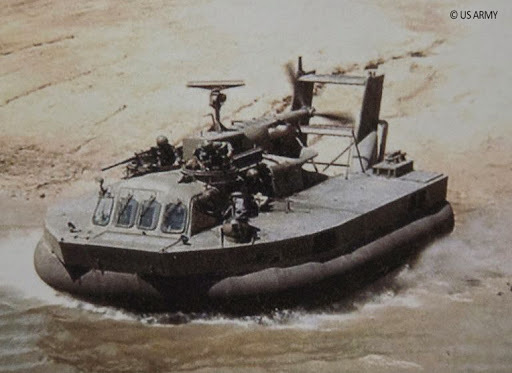 The former had scarf rings each mounting a single 12.7 mm M2 machine gun on the cabin roof, with an M5 40mm automatic grenade launcher fitted to the starboard hull side and two side-mounted 7.62 mm M60s in the cabin. TACV 903 dispensed with the roof-mounted guns and added an M2 machine gun firing through the cargo bay's front door which can't have made loading and unloading any easier. By March 1970, the roof-mounted armament of both surviving ACVs (901 and 903) were a 7.62 mm GAU-2 minigun and a single 12.7 mm M2 machine gun. 903's forward M2 machine gun may later have been replaced with a twin M60. Note: while some sources state that 901 was the only ACV to be fitted with an M5 grenade launcher, photographs clearly show both 901 and 902 to be so equipped. A rather enthusiastic report from August 1968 recommended that heavier weapons be mounted in order to tackle Viet Cong bunkers and advocated replacing the roof-mounted machine guns with 20mm cannon and using the side decks to accommodate either 106mm M40A1 recoilless rifles or AGM-22B ENTAC anti-tank missiles (with Shillelagh or TOW for follow-on models). However, none of this was implemented although the unit commander was prepared to test fire the recoilless rifles from a vehicle without waiting for stateside tests. 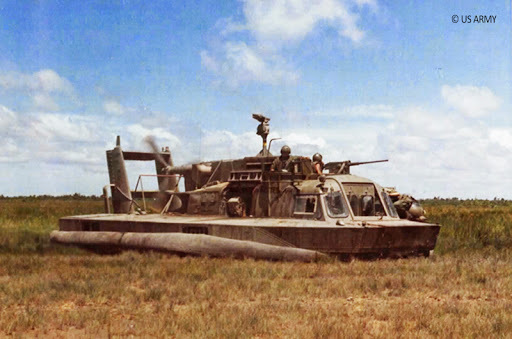 The experimental ACV unit was assigned to the 3rd Brigade of the 9th Infantry Division and underwent several changes in designation: Air Cushion Vehicle Test Unit, Armor Platoon Air Cushioned (Provisional) and Air Cushion Vehicle Unit but it was unofficially known as the 39th Cavalry Platoon after its parent unit. 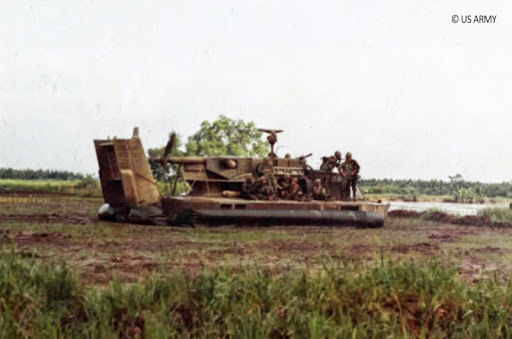 During their 28 months deployment, the ACV unit undertook several types of operations in the Mekong Delta and Plain of Reeds: search and destroy, search and clear, route security, raids, ambushes and combat service support. 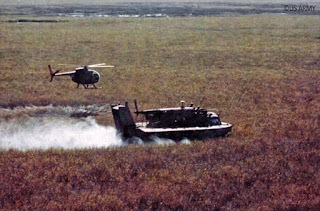 Missions best accomplished by the ACVs in such terrain were listed as reconnaissance, security of canals, cordon of areas to prevent escape, security element for airmobile assaults, border patrolling, assaults against mall enemy units, insertion and extraction of long range patrols, and transport of ground troops. 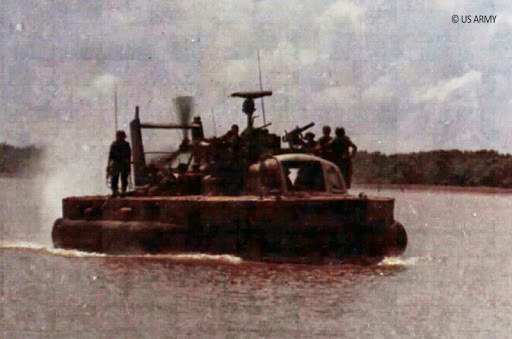 Doctrine called for the whole platoon to operate together, as was the case on 7 June 1968 for its first mission. Howeber, the ACVs usually operated in pairs: at first because one craft was always held back in base for maintenance and/or training and later because the whole platoon only had two surviving machines. At normal loads, the troop carrying capacity was usually found to fall short of the planned 12 men, with 9 being more usual although the theoretical capacity could sometimes be achieved when carrying South Vietnamese infantry. Despite some articles describing troops firing from the side decks this was not done as it was found that spent brass would easily damage the lift fan or the propeller. Indeed, riding the side decks was not without danger and, in November 1968, an ARVN infantryman fell into the lift fan intake of 901 (probably after being shot) with fatal consequences while the hovercraft was out of commission for eight months. As a result, metal bars were soon added to the lift fan intake, along with mesh screens on the side decks. The ACVs were much too noisy to creep up to an enemy unnoticed but their speed combined with the difficulty of pinpointing the source of the noise often made it possible to achieve some degree of tactical surprise. 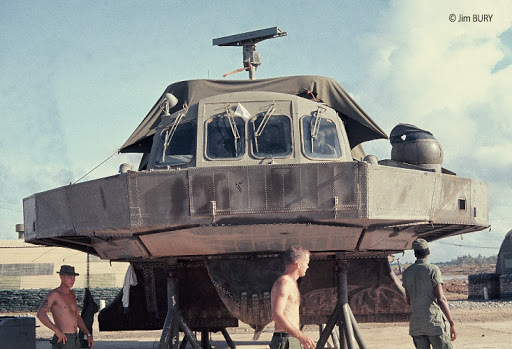 In addition, the 8,5 tons hovercraft could easily be lifted by a CH-54 flying crane which was used for recovery of disabled craft and to provide operational flexibility by quickly shifting to a new area of operations. In the second case, the ACVs along with fuel and a small maintenance shop would be sling-loaded into a firebase which would serve as a temporary base of operations. 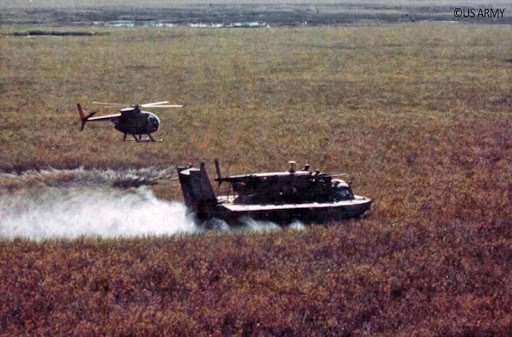 While the ACVs provided a unique capability of fast movement over both water and land, the transition from one to the other was heavily constrained by terrain. Even though the hovercraft could clear a four-foot obstacle, it was restricted by high banks, steep gradients or treelines. In addition, the inland tides could change the water level by 5 to 10 feet turning what had been an accessible bank into a major obstacle. As a result, ACV operations were found to be most effective when coupled with a scout helicopter which could help with navigation. High levels of fuel consumption limited operations to 6 or 7 hours before refueling if it was possible to run at reduced speed, endurance on high speed operations being cut by one third or more. Fuel consumption was also found to increase sharply when operating at full load. With no regular supply chain and the need to ship engines back to the United States for major maintenance (at one point only one of the five available engines was in country with the remainder in transit to and from the Bell plant) the mission ready rate was never very high. Computed over 39 operations, this was only 56% with the unavailable vehicles equally divided between machines down for maintenance and those waiting for critical spare parts although the ratio of maintenance hours per operational hour was a rather creditable 1.14. 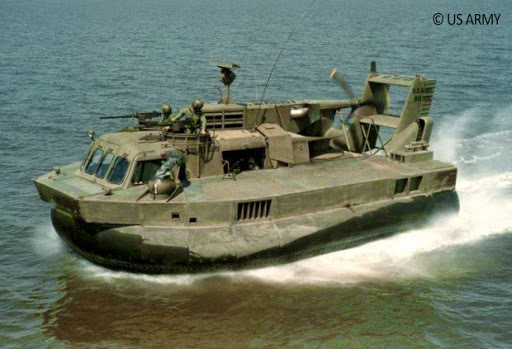 With no ACVs available in the US, training needs also reduced the availability of the hovercraft since the unit had to train its assigned replacements in-country. 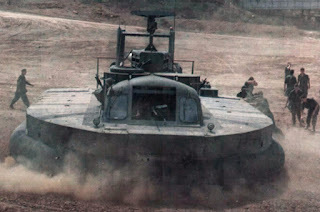 Overall, the ACVs were found to offer in wet terrain the same capabilities that tracked ACAV vehicles offered on dry land. Although the ACVs were delicate and expensive machines costing roughly one million dollars each, it was proposed to expand the unit into a full Air Cushion Cavalry Assault Troop. This would have had ten Assault SK-5s, three in each of three platoons and one command vehicle along with one larger SR.N.6 in each of the Operations and Maintenance sections. However, this was not implemented because the SK-5 hovercraft came to late and offered a solution to a fast dwindling need. Deployed several months after the Tet offensive, the ACVs were introduced at a time when the US Army was already planning for a gradual withdrawal from Vietnam. As a result the 39th ACV platoon ceased combat operations on August 31, 1970, and officially left Vietnam in September. The sole surviving ACV, hull number 903, was returned to the United States and is currently on display at the U.S. Army Transportation Museum in Fort Eustis (Virginia). 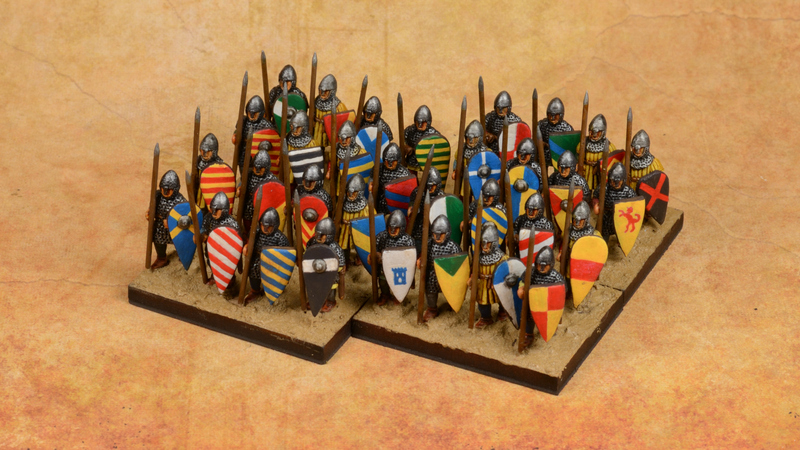 The ACVs wore an overall overall olive drab scheme although the colour seems to have faded very rapidly. Marking were rather simple with small black "U.S. ARMY" stencilled on the sides astride the gun roof positions and a much larger black "U.S. ARMY" on the top of roof intake. The ACV's hull number was applied in large black (this was changed to yellow at some point, presumably to improve visibility from helicopters) characters on top of the upper elevator while the tail sides sported a small black "U.S. ARMY" over the serial number (815901 to 903).